In this article we will take a look at the effects of the vertical rear wheel position in manual wheelchairs. Both custom folding and standard wheelchairs accommodate vertical positioning of the rear wheels. Arranging the rear wheel up or down the framework of a standard wheelchair will affect the seat-to-floor height, positioning in space and rear wheel accessibility. 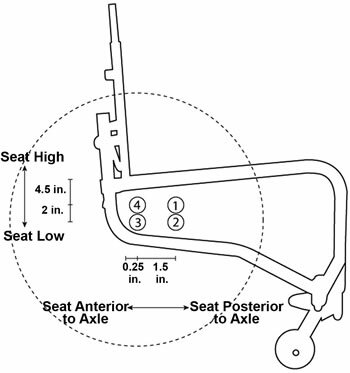 Rear floor- to-seat height is impacted not just by the dimensions of wheels utilized, but also by the elevation of the rear wheels in relation to the framework. When we shift the rear wheels up on the framework, we produce a reduced rear floor- to-seat height. When we shift the rear wheels down on the framework, we produce a taller rear floor- to-seat height. Floor-to-seat elevation impacts several things. Accessibility to the surroundings is impacted by seat-to-floor height. Including having the ability to fit under a workspace or table and reach into cupboards. Transfers, like sliding board or standing pivot transfers, are impacted by the floor- to-seat elevation of the wheelchair. For those who utilize one or both legs to push, getting the proper seat-to-floor elevation is essential to assure simple propulsion and at the same time preserving postural control. The variance in elevation between the front floor- to-seat height and the rear floor- to-seat height generates a fixed tilt, or “dump”, in the wheelchair once the rear floor- to-seat elevation is below the front floor- to-seat elevation. As stated before, when the front floor-to-seat elevation stays the same, yet the location of the back wheel axle is shifted up on the framework, reducing the back floor- to-seat height, fixed tilt develops. One can also produce fixed tilt by altering the front floor- to-seat elevation. This is achieved by leaving the rear floor- to-seat height the same, but employing either a bigger diameter caster, an extended fork or stem bolt, or even making use of a lower opening in the fork, all of these produce an increased front floor- to-seat height. The bigger the change in height between the front floor- to-seat elevation and the back floor- to-seat elevation, the bigger the angle of the wheelchair seat plane, which could make transfers much more challenging because of the impact of gravity when moving out of the wheelchair. The application of fixed tilt on a wheelchair typically impacts postural control, as well as accessibility to the back wheel for individuals who propel by hand. The vertical back wheel positioning on a manual wheelchair is an essential concern since it impacts floor- to-seat elevation, positioning in space, as well as accessibility to the back wheels.